1695 June 5: "Capt Thomas Noyes, Cornl George March, Abraham Merrill & Henry Short appoynted by the Towne to vew a convenient place for a ferry over Merrimack River neer the now dwelling house of John Kelly, Senr, together wth a Rode theretoo and bring report to ye Towne at ye next meeting." The selectmen were also instructed to ask the Court for "the continuation of the fferry so long as the Towne shall judg it beneficiall, the price of sd fferry to be sixpence money for horse and man and twopence for a single man, and for our owne Towne Inhabitants sixpence in pay for horse and man & twopence in pay for a single person." [Town of Newbury Proprietors' Records, vol. i., pp. 22, 23] This difference between "money" and "in pay" was apparently advantageous to citizens of Newbury. This John Swett, Junior, was John  Swett, born 28 February 1677 in Newbury, the oldest son of John  and Mary (Plummer) Swett, grandson of Stephen  and great-grandson of John Swett of Newbury. He married Susanna Page. [Stackpole, head of family # 13, pp. 10 & 14] In 1703 he helped build a road to the ferry that was operated by John Kelly. Eight years later he was licensed to operate the ferry. 1712 February 12: Benjamin  Swett, born 11 April 1688 in Newbury, youngest son of John  and Mary (Plummer) Swett, married Mary Wheeler. [Stackpole, pp. 10 & 15] About this time, he probably went to work for his brother John  as the ferryman at the Newbury end of the ferry. 1712 September 3: The inhabitants of the town of Newbury again ordered the selectmen "to lay out the way from the Bradford road to Swett's ferry." 1712 December 13: The Court of General Sessions appointed a committee "to view the way leading to the ferry under care of John Sweat junior of Newbury." 1713 December: The selectmen of Newbury applied to the General Court for liberty to keep the ferry and pay over annually to the treasurer of the town the amount received for ferriage. 1719 March 4: The following petition was presented by John  Swett to the town of Haverhill. As so often happened, the town clerk misspelled his name. John Sweet petitioning to the Towne as followeth: To the inhabitants of Haverhill this day convened at the meeting house in Haverhill: The petition of John Sweet of Newbury humbly showeth, Whereas there has been a Ferry granted by the Court to the Towns of Haverhill and Newbury for the term of Forty years where I now keep it. I humbly now request that I may have this Towns interest therein during the whole term, and I will carry over the inhabitants of this Town one single person for a penny per time, and a horse & man for four pence & oblige myself to keep good conveniences for the transport of passengers, for which liberality & kindness as in duty bound shall always pray. --- John Sweet. 1731 March 9: "The selectmen of Newbury received from Mr. John Swett of Haverhill the sum of four pounds for the use of the ferry for the two preceding years." [Records of the Selectmen of Newbury] It looks as though 1730 was the last year Benjamin  Swett operated the Newbury end of the ferry. See next entry. 1735 March 11: The inhabitants of the town of Newbury passed the following order: "Our Townes part of ye ferre called Swetts ferre is granted to Joshua Bailey upon his giving to ye selectmen a bond to see said ferre be well tended & also to pay four pound a year, yearly, for three years insuing for ye use of ye Towne of Newbury." [Town of Newbury Records (1731-85), p. 21] John  Swett continued to operate the Haverhill end of the ferry. Eliphalet Swett was my ancestor. He settled in Amesbury, where he was a shipwright, and had a large family. There is still a Swett Street and Swett's Hill in Amesbury, overlooking the Merrimack River. 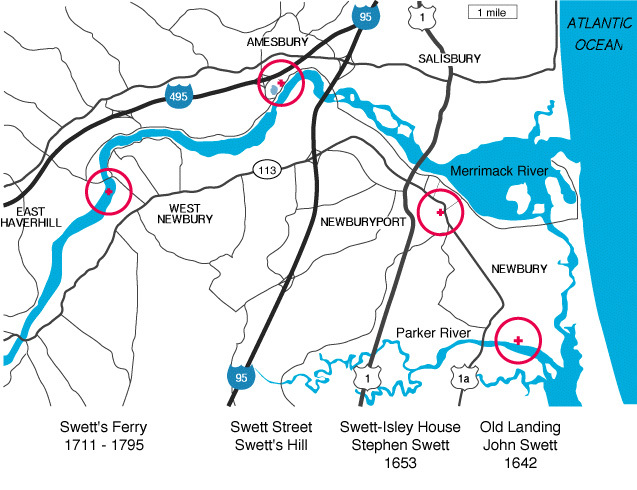 Apparently, Benjamin  Swett was the ferryman at the Newbury end of Swett's Ferry all of his adult life, working for his brother John  from 1711 to 1725 and then for his nephew John  until 1730. 1795 When the Merrimack Bridge later known as Rocks Bridge was built nearby, the ferry was discontinued. It had been there for 100 years. John Kelly established it in 1695 and operated it for 16 years. It was licensed to John Swett, Jr., in 1711. Thereafter, he and his heirs operated both ends of Swett's Ferry for 19 years and the Haverhill end for 78 years.